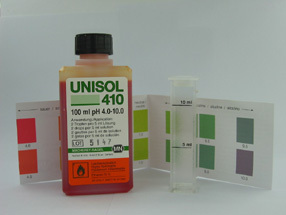 Macherey Nagel UNISOL 410 pH indicator solution. This method is designed for testing pH in weakly buffered solutions such as dilute acids and bases. Tests the range pH 4 to 10 in half pH unit steps. Kit includes 100 ml of indicator solution, colour chart and plastic cuvet. Applications include water, wastewater, surface waters, aquariumss and unbuffered solutions. To test pH fill the cuvet with 5 ml of the sample solution. Add 2 drops of indicator and compare the resulting colour against the colour card. The indicator can also be used to test pH on surfaces like paper by adding a drop directly onto the surface. In this case the colour intensity will be higher but the colour tone will be distinct. Please note that this product contains 100 mls of ethanol. Therefore outside Australia shipments by air are not possible. Internal shipments may be restricted to road transport and additional charges may apply. Please contact us for details.